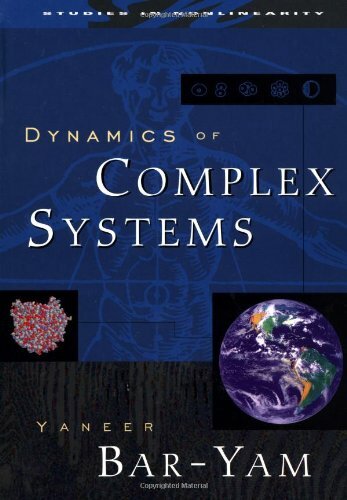 Textbook for seminar/course on complex systems. The study of complex systems in a unified framework has become recognized in recent years as a new scientific discipline, the ultimate of interdisciplinary fields. Breaking down the barriers between physics, chemistry and biology and the so-called soft sciences of psychology, sociology, economics, and anthropology, this text explores the universal physical and mathematical principles that govern the emergence of complex systems from simple components. Dynamics of Complex Systems is the first text describing the modern unified study of complex systems. It is designed for upper-undergraduate/beginning graduate-level students, and covers a wide range of applications in a wide array of disciplines. A central goal of this text is to develop models and modeling techniques that are useful when applied to all complex systems. This is done by adopting both analytic tools, from statistical mechanics to stochastic dynamics, and computer simulation techniques, such as cellular automata and Monte Carlo. In four sets of paired, self-contained chapters, Yaneer Bar-Yam discusses complex systems in the context of neural networks, protein folding, living organisms, and finally, human civilization itself. He explores fundamental questions about the structure, dynamics, evolution, development and quantitative complexity that apply to all complex systems. In the first chapter, mathematical foundations such as iterative maps and chaos, probability theory and random walks, thermodynamics, information and computation theory, fractals and scaling, are reviewed to enable the text to be read by students and researchers with a variety of backgrounds. Please click the following links to download Dynamics of Complex Systems in PDF format. Prof. Bar-Yam recommends reading Chapters 2, 3, 8 and 9 first. Professor Yaneer Bar-Yam received his S.B. and Ph.D. (1984) from MIT. He has been teaching the course from which this book was drawn for several years both at Boston University and at MIT. Students in the course come from many different fields of science, social science and engineering. He is President of the New England Complex Systems Institute. For more information on him, please visit his homepage.